Hungarian pianist and composer; born at Budapest May 15, 1815; died in Paris Jan. 14, 1888. He was originally destined for the law, but soon decided to devote his life to music. At the age of nine he had already been sufficiently advanced to play with his teacher, F. Brauer, at the theater in Budapest, the concerto by Dussek for two pianos. Shortly afterward he went to Vienna to study with Charles Czerny, and later with Anton Halm. In 1827 he gave concerts in Vienna, and from 1829 to 1832 made a concert tour with his father through Hungary, Poland, and Germany. After passing the winter of 1830 at Hamburg, he returned to Budapest by way of Cassel, Frankfort, Nuremberg, and Augsburg. In the last-mentioned city he was taken ill, and was soon afterward adopted by a wealthy patron of music. In 1838 Heller went to Paris, where he entered that brilliant musical circle of which Liszt, Chopin, and Berlioz were conspicuous members. Here Heller eventually achieved high distinction both as a concert performer and as a teacher. In 1849, and again in 1862, he visited London, on the latter occasion playing with Halle at the Crystal Palace (May 3) Mozart's E-flat concerto for two pianos. With these brief interruptions the last twenty-five years of his life were spent at Paris. Heller's numerous compositions, solely for pianoforte, are celebrated for their originality, grace, and elegance. 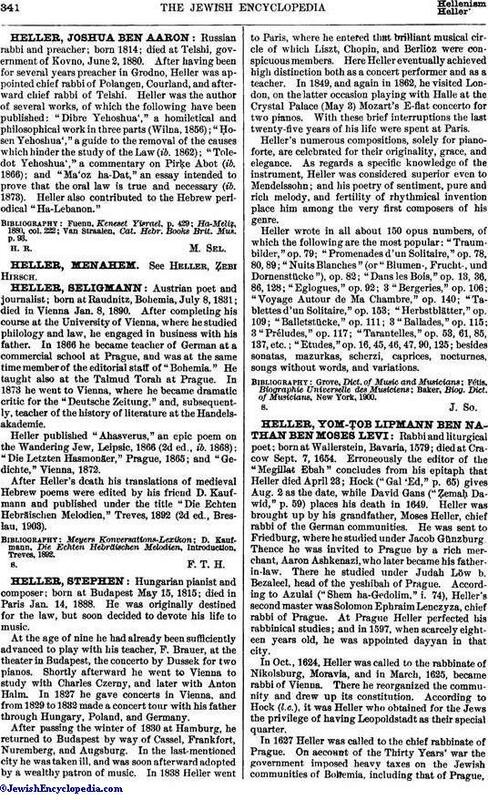 As regards a specific knowledge of the instrument, Heller was considered superior even to Mendelssohn; and his poetry of sentiment, pure and rich melody, and fertility of rhythmical invention place him among the very first composers of his genre. Heller wrote in all about 150 opus numbers, of which the following are the most popular: "Traumbilder," op. 79; "Promenades d'un Solitaire," op. 78, 80, 89; "Nuits Blanches" (or "Blumen-, Frucht-, und Dornenstücke"), op. 82; "Dans les Bois," op. 13, 36, 86, 128; "Eglogues," op. 92; 3 "Bergeries," op. 106; "Voyage Autour de Ma Chambre," op. 140; "Tablettes d'un Solitaire," op. 153; "Herbstblätter," op. 109; "Balletstücke," op. 111; 3 "Ballades," op. 115; 3 "Préludes," op. 117; "Tarantelles," op. 53, 61, 85, 137, etc. ; "Etudes," op. 16, 45, 46, 47, 90, 125; besides sonatas, mazurkas, scherzi, caprices, nocturnes, songs without words, and variations.